It's been a pretty long time since I was MIA, I know eh!! Life has been a roller coaster ride for me past months as I quit my job than my makeup course consuming most of my time along with some family commitments. But I'm back now (hopefully) and continue the blog like before. I was sent Eye Of Horus Cosmetics few weeks ago and I was absolutely thrilled to try them out, and the minute I received my box I was jumping like a baby having chocolates in both hands ^_^ Sounds crazy eh? I know but I was over-joyed and smitten by black beauty completely. Eye of Horus is an Australian, Byron Bay brand of colour cosmetics. In a short time the brand has already reached cult status amongst fans, celebrities and professional Make-up Artists and has exported to New Zealand, the Philippines and just launched in the UK & Europe. Eyebrow Define Pen in Dynasty (medium) & Nile (medium dark). I never thought after using my ABH dip brow pomade I'll be liking any other brow product, but these babies proved me wrong. The mechanical twist up pen with wax formula is a perfect dupe of ABH brow whiz. The formula is smudge proof and once set it won't budge. 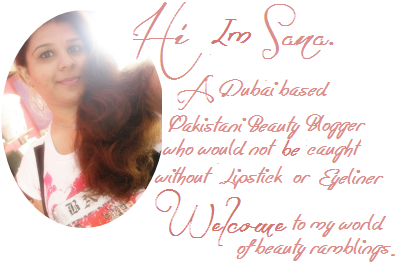 The formula is perfect that blends in naturally and delivers a stunning natural look without any efforts. Goddess Mascara is one of my absolute favorite because of its unique formula that formulated in the style of the ancient Egypt. The formula is just WOW to give a perfect oomph to the lashes without being too dramatic. Liquid Define Eyeliner for a perfect flick or for a person who wears winged eyeliner, this is just PERFECT and absolute MUST-HAVE. A felt tip marker that can be use as subtle and as bold as possible with complete precision with jet-black flick that dries petty quickly into a gorgeous black flick without budging,flaking or cracking. Eye Pencils in Emerald Tabula (green), Jewel Amethyst Purple Pencil, Lazuli Blue Goddess Pencil, Scarab Sapphire Pencil & Smokey Black Goddess Pencil - an illuminating eye pencils range with glistening color pay off and once again based on formula of the Ancient Egypt i.e. beauty and mystique hand in hand. Highly pigmented gel-based formula that dries instantly. And once dried it won't budge or smudge. To be honest I'm beyond surprised as I was not expecting such great results They have a illuminating makeup range with sacred ingredients including Organic Moringa Oil also knows as Oil of the Pharaohs, claimed by the gods for its beautifying and regenerating powers and the ancient oil of Castor Oil. I'll be posting detailed review later but if you want me to do review any of the product in particular do let me know in the comments below and don't forget to check their official website out here as currently they are running a promotion. Spend over $50 and get a FREE black liquid define eyeliner. Have you tried any of their products ? What do you think about them? 19 comments on "Eye Of Horus Cosmetics - First Impression"
I got the eye pencil in brown in the British Beauty Blogger Dream Box 3 and it is by far the best eye pencil I've ever used. It glides on with amazing pigmentation using just the lightest touch. I don't often rave about beauty products but this is the bee's knees! Lucky you having all those goodies! I got the eye pencil in brown in the British Beauty Blogger Dream Box 3 and it's the best eye pencil I've ever used. It glides on so smoothly with amazing pigmentation without any dragging. I don't often rave about beauty products but this is the bee's knees! I adore EOH products, they rock! They're one of my favorite brands and their pencils are my Holy Grail favorites! Not heard of this brand before, they look good though. So many lovely goodies, I'm very envious! Wow! The eye pencils look great! you got a very nice blog. Following you. Coming to the post. The products looks to good,by the packing. Waiting for the swatches and your review about the. Your Comments Make My Days , Feel Free To Comment. Please Don't Be Rude And Harsh And Feel Free To Share Your Views But Related To Post Only.